Take your garment sewing to the next level. Sign up to unlock this free PDF from Threads magazine and sponsored by Contemporary Fashion Education. Not all garment seams are made equal and not all need the same seam allowances. While pattern companies typically make seam allowances the same width for convenience, the fashion industry uses different guidelines, meant to give clothes proper structure and drape. Production patternmaker Laurel Hoffmann details this insider information in her article for Threads #199, Oct./Nov. 2018. Learn the best practices for reducing seam allowances and incorporating seam allowance variations in your next garment in the free PDF of Laurel’s article sponsored by Contemporary Fashion Education. Download the PDF below, and be sure to sign up to receive more tips, tricks, and insider information from Contemporary Fashion Education and Threads. 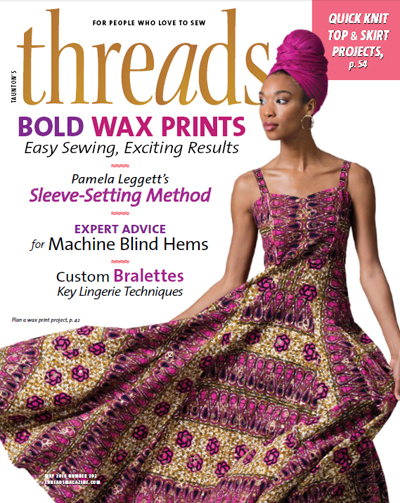 Send me the weekly eletter filled with expert advice, videos, interviews, tips and more from Threads magazine. Send me Threads special offers, product news, and opportunities to provide feedback. Click the button to download "Industry Seam Allowances"